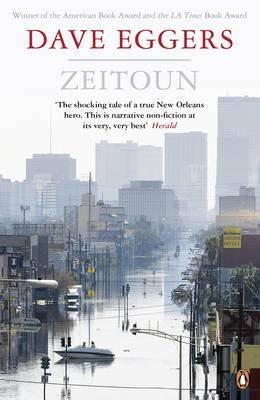 Zeitoun, the latest non-fiction work by Dave Eggers, is just out in paperback. Eggers himself has disappeared into the prose: the perspective is that of Abdulrahman Zeitoun, a hard-working decent family man who runs a house-painting business in New Orleans. The early parts of the book tell the story are set in the lead-up to Hurricane Katrina in 2005. Zeitoun came from Syria after ten years as a merchant seaman, and worked ferociously hard to build up his business with his wife Kathy. He is a living embodiment of American values. When the hurricane strikes, he stays behind in the city as his wife and children escape for their own safety, initially to look after his business interests, but then increasingly as a knight in shining armour (or, rather, in a canoe) helping people in his flooded neighbourhood. And then something truly dreadful happens. You read the second half of the book in horror. In the week that Osama bin Laden was killed, it is timely to be reminded of the terrible challenges that Muslims in America can face, even one so 'American' as Zeitoun. Zeitoun is a model piece of story-telling, being restrained, empathetic and un-showy. It is studded with extraordinary scenes. Click here for the Zeitoun Foundation website.